First, the cool news: Syne Mitchell interviewed me, Claudia, and Alison (my two partners in Weavolution) a few weeks ago, and the interview is now up in the latest Weavecast!Â Syne did a fantastic job of editing the interview, so if you want to hear all about Weavolution, go to the latest episode and listen to it.Â Way cool! The poppies turned out to be a washout; the flowers had nearly all faded by the time weÂ arrived on Saturday morning.Â That’s wildflowers for you: ephemeral!Â But we did see some beautiful slopes outside the Poppy Reserve that were literally orange with poppies (and gold with the tiny goldflowers), so I don’t feel entirely cheated. I also got to see a Mojave Green rattlesnake up close and personal! while we were out hiking, so I’m pretty excited about that.Â I only got to see the tail end as the front end was buried in some brush, but it was still really nifty to see the sagebrush-green body with bleached markings, and the very distinctive rattle.Â I was going to take a photo of it, but decided that would probably be unwise, so after watching it for awhile (from a respectful distance) I went on. Not as impressive as a shot of an entire field of them, but still, there’s something about California poppies that just makes one happy, isn’t there?Â They’re so beautiful, so cheerful, so ephemeral.Â A gift from nature. This is all pretty time-consuming, so I’m getting a pretty good understanding of why people went to fusible interfacing once they had the opportunity to do so.Â Â Still, I’m enjoying the process. Read up on the coat assembly process, apply interfacing where needed, and start basting together the pieces for a final fitting.Â Read up on how to manage the facing and the lining. Dye a few more sample colors for the putative wedding dress, in preparation for CNCH in two weeks. Start thinking about what to create for the Complex Weavers Fine Threads study group exchange – mine is due in early May, oy vey!Â I am thinking I will use some of the CNCH samples for this but haven’t really decided yet. My word, you were able to do all that stitching in the car? I’d have stuck my fingers on the needle so many times, I’d be leaving marks on the fabric! Sorry we didn’t make connections over the weekend. Next time, I’m sure we’ll be able to work it out. That collar looks like smoked salmon! 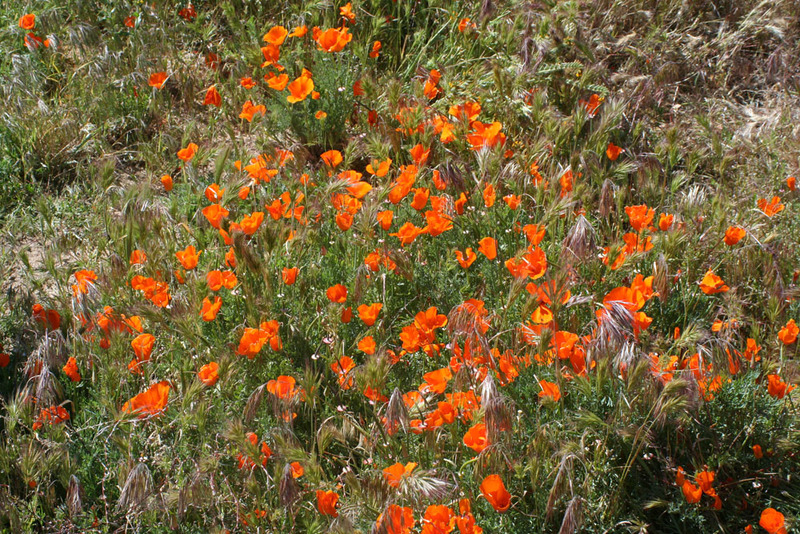 Love those California Poppies. They’re so unabashedly cheerful, even if you just get to see a few, there they are, just beaming away! The padstitching is fascinating, and something I’ve not seen before. I look forward to getting to see a show-and-tell of the garment or the piece, some time. The interview with Syne was great. I’m really excited to see this project developing, and can hardly wait to play, er, experiment, in it!